It's Post Time! Horses to the Starting Gates of Summer! It's Derby Weekend! The official start of the Southern social calendar, where Summer is a verb and hats are always recommended! My grandfather was a rabid horse racing fan (once hit the Derby trifecta for $1300), and my mother is an old-school Southern debutante. Needless to say, Derby is a BIG DEAL in our house. Of course, no Derby viewing is complete without mint juleps. There is much debate on how to craft the perfect mint julep, the proportions of ingredients, the ratio of mint to sugar to bourbon, and so on and so forth. Let a true Southern gentleman tell you how it's done. Your letter requesting my formula for mixing mint juleps leaves me in the same position in which Captain Barber found himself when asked how he was able to carve the image of an elephant from a block of wood. He said that it was a simple process consisting merely of whittling off the part that didn't look like an elephant! The preparation of the quintessence of gentlemanly beverages can be described only in like terms. A mint julep is not a product of a formula. It is a ceremony and must be performed by a gentleman possessing a true sense of the artistic; a deep reverence for the ingredients and a proper appreciation of the occasion. It is a rite that must not be entrusted to a novice, a statistician nor a Yankee!. It is a heritage of the Old South; an emblem of hospitality and a vehicle in which noble minds can travel together upon the flower-strewn paths of a happy and congenial thought. Go to a spring where cool, crystal-clear water bubbles from under a bank of dew-washed ferns; in a consecrated vessel, dip up a little water at the source. Follow the stream thru its banks of green moss and wild flowers until it broadens and trickles thru beds of mint growing in aromatic profusion and waving softly in the summer breeze. Gather the sweetest and tenderest shoots and gently carry them home. Go to the sideboard and select a decanter of Kentucky Bourbon distilled by a master hand, mellowed with age, yet still vigorous and inspiring. 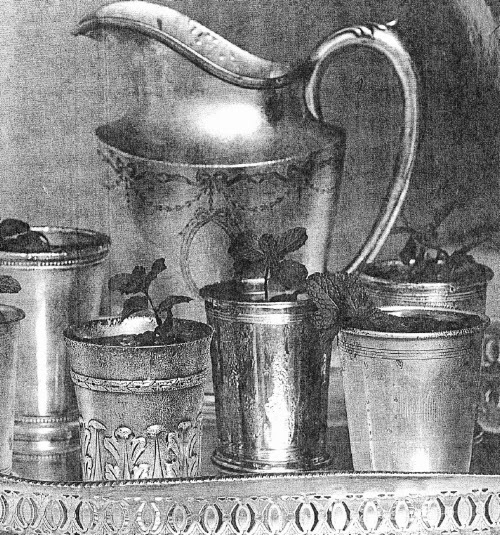 An ancestral sugar bowl, a row of silver goblets, some spoons and some ice and you are ready to start. Into a canvas bag, pound twice as much ice as you think you will need. Make it fine as snow, keep it dry and do not allow it to degenerate into slush. Into each goblet, put a slightly heaping teaspoonful of granulated sugar, barely cover this with spring water and slightly bruise one mint leaf into this, leaving the spoon in the goblet. Then pour elixir from the decanter until the goblets are about one-fourth full. Fill the goblets with snowy ice, sprinkling in a small amount of sugar as you fill. Wipe the outside of the goblets dry, and embellish copiously with mint. Then comes the delicate and important operation of frosting. By proper manipulation of the spoons, the ingredients are circulated and blended until nature, wishing to take a further hand and add another of its beautiful phenomena, encrusts the whole in a glistening coat of white frost; thus, harmoniously blended by the deft touches of a skilled hand, you have a beverage eminently appropriate for honorable men and beautiful women. When all is ready, assemble your guests on the porch or in the garden where the aroma of the juleps will rise heavenward and make the birds sing. Propose a worthy toast, raise the goblets to your lips, bury your nose in the mint, inhale a deep breath of its fragrance and sip the nectar of the gods!